Today, you will be picked by our driver guide from your hotel at 0600 am and head to Jinja. From Kampala it’s about 2 ½ hours to the spectacular Bujagali Falls. After you will be briefed about rafting. Rafting starts for 5 – 31kms – 5/6 hours rafting and you will have the chance to watch the local fishermen and the fantastic birdlife.Alternatively choose to go for wild or mild. Here you choose to raft in the paddle-powered boats for one of the wildest raft rides on the planet, or opt to be rowed downstream by our professional guides in the safety raft. Day 4: Transfer to the Airport. After taking your early morning breakfast, depending with your flight time, you will be transferred to the airport to catch up with your flight as you wave bye – bye to the Pearl of Africa. End of the 4 Days Fishing and Rafting Adventure Safari in Uganda. Gilly and fishing equipment for trolling for up to 4 persons on board. 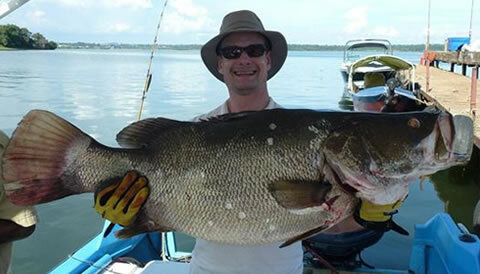 The 4 Days Fishing and Rafting Adventure Safari in Uganda package to exclude expenses of personal nature like: drinks, laundry, tips, telephone, cigars, etc. NB: What to bring on board. We suggest you bring as much sun protection as possible – hats, sunglasses, creams as it can be quite hot out on the lake (average day time temperatures are in the mid to late 20 degrees C). Strops or sandals are a good idea as you may well get wet feet – especially getting on and off the boat! Insect repellent is a good idea. A camera if you’d like to capture “the big fish” on film and a pair of binoculars if you are keen on birdlife. . Light daywear such as T shirts and shorts are normally fine but we recommend a rain jacket in case of bad weather and a sweater or light jacket for cooler weather and the evenings.